We hope readers understand it as a happy coincidence that as Daniel Kasman prepared to praise Eureka!/Masters of Cinema for its fantastic work of (among other things) bringing the films of Maurice Pialat to a new generation of English-speaking cinephiles, I was conjuring up a consideration of just one such release. We decided that we'd put up both pieces...either because we're both stubborn bastards or because we think this is a really big deal. No, the latter, really. We think you'll agree. 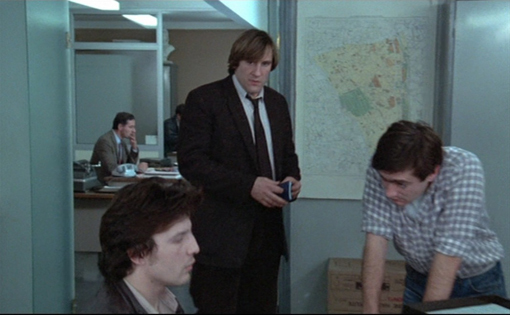 The first time they meet, Inspector Mangin (Gerard Depardieu) comes up behind drug-ring suspect Noria (Sophie Marceau), quietly puts a gun to her back, and says, "Police. Don't move." "But I haven't paid for my coffee yet," she protests. Mangin throws a coin on the counter where her espresso sits, says "It's on me," and pulls her out of the bistro. Over an hour later, Mangin is holding Noria in a desparate embrace, muttering "I've never loved anyone." Trying to convince her to sever her ties to the Tunisian drug runners he's pursuing, he puts his own life on the line to settle a little matter of 200,000 francs between Noria and the gang. How did we get from point A to point B. Or, some might ask, how could we not get from point A to point B. The conflicted cop who falls hard for the putative bad girl is one of the heartiest commonplaces—hell, cliches—in genre cinema. But Maurice Pialat's 1985 Police departs radically from genre convention—every other film wherein this kind of romance happens rationalizes and even valorizes the "love story." Police shows it as a kind of lunacy. Which of course is par for the course in Pialat, but the director's not without sympathy for Mangin's plight. 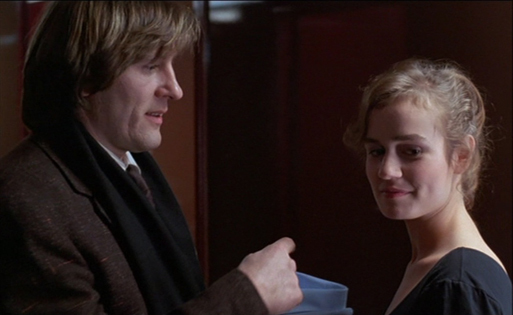 The fellow looks for love in all the wrong places—with a remarkably chipper young prostitute (Sandrine Bonnaire), of whom he asks, at a particularly inapt moment, "You don't believe in love? "; with a straight-arrow colleague (Pascale Rocard), who rejects him with straightforward commonsense (which comes as something of a shock considering how erratic everyone else in Mangin's world seems); with Noria, passionately and he hopes for good; and finally with an unseen woman (whose identity, for what it's worth, is revealed in an interview with Pialat's editor Yann Dedet in an extra on the second disc of Eureka!/Masters of Cinema's superb Region 2 edition of the film). It's fascinating to watch as Pialat's film, which was conceived as a sort of star-studded comeback for the director (his prior picture, A nos amours, while acknowledged as a classic today, did poor business in France) evolves from a kind of procedural into a typically probing and painful study of loneliness and rage. Watching the film a second time, one better understands that it really is an evolution rather than a tonal shift (as is suggested by those who note that the film's final third is more improvised than its prior sections). After all, Catherine Breillat, the film's main screenwriter, is someone who is hardly not concerned with the raw stuff of life...and it's the attitude, the stance, that each of the film's performers establish early on that enables Police to plumb the emotional depths it does. And, of course, as Dedet notes, the ellisions and pauses Pialat sews into his cinematic structures are also a huge part of what gives Pialat's films both their immediate and sustaining powers—and they're here in spades. Fantastic film, fantastic disc. I think this film is rather underrated. The performances and camera work alone are really captivating.